Activities kick off at 8 a.m., Oct. 8, with coffee and doughnuts in the Student Union Building Quiet Lounge. Parent Seminars will follow the reception at 9 a.m. in the SUB Governors Room and SUB Alumni Room. The festivities move to Baldwin Auditorium at 11 a.m., where parents will hear from Truman’s President Barbara Dixon and Student Senate President Mark Kirtland. Kirtland is a sophomore business administration major from Overland Park, Kan. The Centennial Hall Senate will be sponsoring Festival Centennial from 11 a.m. until 7 p.m., in front of the residence hall. After the assembly, families are invited to a barbecue-style lunch from 11:30 a.m.-1:30 p.m. in Red Barn Park. Tickets are $6 and must be purchased in advance at the Public Relations Office in McClain Hall 101. Students with a purchased meal plan may eat for free with their Truman ID. Sporting events begin at 11 p.m., when the men’s soccer team plays Mercyhurst (Pa.) at the Soccer Field. The football team challenges Emporia State (Kan.) at 2 p.m. in Stokes Stadium. Tickets can be purchased Oct. 8 at Reception on the Mall. The women’s soccer team will be competing against Northwest Missouri at 3 p.m., at the Soccer Field. The Second Annual Community Day will take place from 2-8 p.m. on the Quadrangle. Entertainment continues through the evening with the Latin Dance Party, the final Hispanic Heritage Month Event. Dance lessons will be given from 6-8 p.m., Oct. 8, in the SUB Down Under. A dance party will follow from 8-11 p.m. Everyone is encouraged to learn salsa moves and put them to use. Refreshments will be served. Alfred and Seymour will perform at 8 p.m. in Baldwin Auditorium. Sponsored by the Student Activities Board, the event is free for students with a Truman ID and tickets will be available before the performance for $2. The Wind Symphony band, the University Orchestra and the Cantoria singers will perform at 2 p.m., Oct. 9, in Baldwin Auditorium. Many of Truman’s United Way group leaders gather after a workshop to kick-off the United Way campaign on Sept. 29. Group leaders at the workshop include (front row, left to right): President Barbara Dixon, Dale Blesz, Gene Schneider, Maggie Schmitz, Lana Brown, Martha Bartter, Judy Alexander, Roberta Donahue, Sue Neely, Mary Jane Kohlenberg and Erika Sterup. Second row (left to right): David Conner, Kay Anderson, Traci Hill, Lindsay Johnson, John Bohac, Todd Kuhns, Michael McManis, Rachel See and David Nichols. Back row (left to right): Nancy Pennington, Tracy Mullins, Teri Heckert, Jane Story, Linda Yager, Marilyn Gibbons, Lena Reardon, Donna Bailey, Marianna Giovannini and Lesa Ketterlinus. This year the Truman campus United Way fund drive kicked-off with a workshop for group leaders. Leaders are contacting Truman employees to give them the opportunity to contribute toward the support of any one or all of the 13 local agencies served by the Adair County United Way. Truman employees may contribute by using payroll deduction. A pledge of $104 gives each Truman employee a chance to win one of five packages valued at $400 each. The campus community of faculty, staff and students will be working together throughout the month of October to reach this year’s Truman goal of $52,000. Truman has collected a total of $17,912.10 so far, which is 34 percent of the goal. The Truman State University Kohlenberg Lyceum Series is proud to present the acclaimed Shangri-La Chinese Acrobats at 7:30 p.m., Oct. 18, in Baldwin Auditorium. For more than 20 years this multicultural multifaceted production has featured feats of daring balance, dazzling acrobatic displays, and explosive Kung Fu. The Shangri-La Chinese Acrobats have made several television appearances and have been awarded the Performing Arts Campus Entertainment Award by the National Association for Campus activities, and nominated for the Campus Activities Today Reader’s Choice Award for Best Live Novelty Act. Free tickets for the Shangri-La Chinese Acrobats will be available Oct. 11 for students at the SAB office and for faculty and staff in the CSI with University ID. The Truman Bookstore, Barnes & Noble Booksellers, is a platinum level corporate sponsor of the Series. For more additional information about this Kohlenberg Lyceum event, call 785.4016. 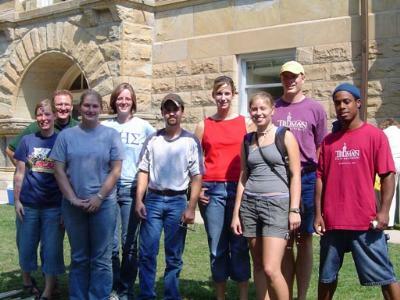 The Truman State University Foundation is pleased to announce that applications are now available for the spring 2006 Foundation Scholarships. Students may apply by going to https://secure.truman.edu/isupport-s/login.asp?page=/isupport-s/Default.asp. Applications for spring 2006 are available from Oct. 1 until Nov. 1. Four new scholarships are being awarded for the first time this spring. They include the Paul Talley and Matt Johnson Memorial Scholarship, Truman Student Government Scholarships, Carrie Nauyalis Scholarships and Don & Nelly Poe Scholarship. The Paul Talley and Matt Johnson Memorial Scholarship was established as a tribute to the contributions of Paul Talley and Matt Johnson to the field of photography. Talley, 44, and Johnson, 25, were among 13 people killed aboard a commuter plane crash on Oct. 19, 2004, near Kirksville and were part of the Hawkeye Creative Communication team assisting Truman with the creation and design of new University publications. The Truman State University Government Scholarships were established by the Student Senate at Truman State University in an effort to maintain communication with members of the Kirksville community and to recognize outstanding student leaders who permanently reside in Adair County. The Carrie T. Nauyalis Communications Scholarship was established by Carrie T. Nauyalis, a 1994 communication graduate, to assist out-of-state students with financial need who are studying communication. The Don & Nelly Poe Scholarship was established in 2004 by Jeff Poe in honor of his parents. It is designated for graduates of Kirksville High School who are in the business program at Truman. The mission of the Truman State University Foundation is to support the goals and activities of Truman State University by obtaining financial support, nurturing viable relationships with external constituencies, and serving as prudent financial stewards of the Foundation’s resources. 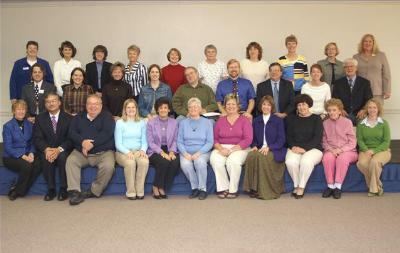 The Foundation exists as a tax-exempt, charitable foundation and is governed by a volunteer Board of Directors. To learn more about establishing scholarships at Truman, contact the Office of Advancement at 785.4133 or e-mail bpike@truman.edu. Pictured above are some of the students involved in the FoodFest including (left to right) Jennifer Glass, Michael Seipel, associate professor of agriculture, Tammy Bragg, Katie Smith, Josh Schaeffer, Lesley Sheridan, Cassie Phillips, David Chappell and Eric Moore. Sept. 10 marked the fifth annual Northeast Missouri FoodFest on the Square in Kirksville. Students from AGSC 415, “Ethical Issues in Sustainable Agriculture,” helped with the FoodFest, which brings together local farmers and consumers to promote sustainable agriculture. This year’s FoodFest featured live music by RedWing, a local foods cookoff, and face-painting for the kids. 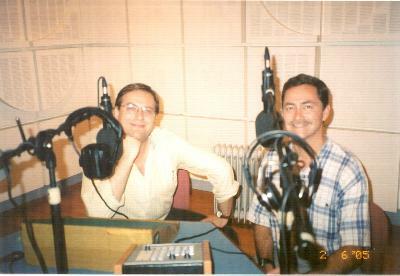 Gregory Jones, professor of music at Truman, (right) and Nikos Xanthoulis of the Athens Conservatory (left) before they go on the air for a live hour-long interview on Greek Public Radio. Gregory Jones, professor of music and artist in residence in Greece 1995, helped lead a tour of Greece and Italy during the past summer with the Truman State University Cantoria and Brass Ensemble with performances in Athens and the island of Corfu in Greece and in Cremona and Lucca in Italy. Jones also was the featured guest on the prestigious National Radio Third Programme in Athens, Greece in June. During the hour-long program, they played music from his CD “Alternate Voices,” and discussed music performance and education. Later in the summer, Jones also performed at the International Trumpet Guild Conference in Bangkok, Thailand. An Athens Conservatory trumpet student who began studying with Jones during his Greek Fulbright, Takis Balamos, has been selected as a permanent member of the trumpet section of the Athens State Orchestra, the home orchestra of the prestigious Megaron Music Center in the capital of Greece. The Missouri Travel Council will offer two $1,000 scholarships to currently enrolled sophomores, juniors or seniors in an accredited college or university in the State of Missouri. Applicants must be pursuing a hospitality related major such as hotel/restaurant management, parks and recreation, etc., must be a current resident of Missouri, must have a grade point average of at least 3.0, and submit a written essay. To obtain an application for this scholarship, please stop by McClain Hall 103. The application deadline is Nov. 1. Barbecue lunch costs $6 per person; free for Truman students with a meal plan if they present their student ID. Lunches must be purchased in advance. Call Athletics at 785.4235 for general admission prices. Salsa lessons will start promptly at 6 p.m. Sponsored by Multicultural Affairs, HALO and Sigma Lambda Gamma Sorority, Inc. Admission is $2. Students with a Truman ID get in free. Sponsored by the Student Activities Board. All majors and students with junior and senior status are encouraged to apply. Applications are available in McClain Hall 101 or at http://career.truman.edu/student/internship/mogov_app.pdf. During this three-week trip to England and Scotland students will explore the construction of national identity through the study of these two major figures of history and legend. Sites visited include London, Edinburgh, Stonehenge, Glastonbury, Tintagel, Iona, Durham, and York. Six hours of credit: three in Art History and three in English (also fulfills Writing Enhanced and Intercultural LSP requirements). For more information, please contact Christine Harker (charker@truman.edu) or Sara Orel (orel@truman.edu). Contact Harker at charker@truman.edu or Orel at orel@truman.edu, if you are unable to attend a session and/or would like more information. What are we learning about extrasolar planets? This event is co-sponsored by RCP and the Career Center. Applications are due at 5 p.m., Oct. 11, in the CSI. Call 785.4222 for more information or fax 785.7435. The dean of the Residential College Program will discuss images of gender in Truman Homecoming posters. Mark Kerkhoff, a senior business administration major from Quincy, Ill., received the Brother of the Year award, also titled the True Blue Award, at the Alpha Kappa Psi national conference in Las Vegas. This is the highest award a student leader of Alpha Kappa Psi can receive. Kerkhoff is currently the Alpha Kappa Psi Tau Upsilon chapter president. The Financial Wellness Workshop will be at 11 a.m., Oct. 4, in the SUB Activities Room. This free workshop is open to all students and organizations. Snacks and drinks will be provided. For more information, contact the CSI at 785.4222. The Phi Kappa Phi Fall Luncheon will be from 11:30 a.m.-1 p.m., Oct. 4, in the SUB Spanish Room. There will be a free pizza lunch. Please R.S.V.P. to Debbie Nothdurft at 785.7115. Informational meetings for the Sacred Feminine in Ancient Greece, a three-credit hour study abroad course, will take place at 6 p.m., Oct. 4, in the SUB Spanish Room. For more information on this class planned for June 7-21, contact M. Lynn Rose at lynnrose@truman.edu or at 785.4057. The Art of Living Club is having an introductory meeting for its Art of Living course at 7 p.m., Oct. 4, in Baldwin Hall 252. The course is an 18-hour intensive introduction to yogic postures, breathing, meditation and wisdom that will be Oct. 6-10. For more information, contact Lloyd Pflueger at 785.4056 or Matt at 627.5813. The Division of Fine Arts presents “Fortinbras” at 8 p.m., Oct. 4-8, in the Ophelia Parrish Courtyard Theatre. Tickets cost $2 each. Call 785.4515 for questions or to reserve tickets. University Counseling Services will be offering free, confidential screenings for depression, bipolar disorder, generalized anxiety disorder and post-traumatic stress disorder from 10 a.m. until 3 p.m., Oct. 5, in the SUB. At the screening, students will be able to talk confidentially with a counselor about their personal situation. Contact Diane Pletcher or Joe Hamilton at 785.4014 for more information. The Center for Teaching and Learning will continue its Weekly Lunch Series at 12:30-1:30 p.m., Oct. 5, in the SUB Spanish Room. The topic of this week’s lecture is “Scholarship for Teaching and Learning (SoTL). What is it? And what’s in it for me.” Contact the Center for Teaching and Learning at 785.4391 for more information. Leslie Hahner’s COMM 381 class is hosting Katrina Relief: A Night on the Town. The event will take place from 5-8 p.m. Oct. 5. This event is sponsored by Alpha Sigma Alpha. Contact Christine Schlosser at 785.5369 for more information. An informational meeting for prospective McNair Scholars will be at 6 p.m., Oct. 5, in Violette Hall 1236. Students must have achieved at least sophomore status. The deadline for submission of applications is Nov. 10. Comedian Lorne Newton will be presenting an evening of comedy from 7-8 p.m., Oct. 5, in Baldwin Auditorium. For more information, contact Greg Wisa at 785.7189 or gaw001@truman.edu. The Hurricane Katrina Charity Poker Tournament will continue from 7-10 p.m., Oct. 5, in the SUB Georgian Room. A $2 donation is requested at each event. The final table will be from 7-10 p.m. Oct. 12. Weekly and final prizes will be awarded. Sponsors for this tournament include the SUB, Phi Lambda Phi and SAB. For more information, e-mail bbarks@gmail.com. A Wind Symphony concert will take place at 8 p.m., Oct. 5, in the Ophelia Parrish Performance Hall. For more information, contact Dan Peterson at 785.7397. Human Resources will be having an informational fair for faculty and staff from 9 a.m. until 3 p.m. on Oct. 6 and 9 a.m. until noon on Oct. 7 in the SUB Governors Room. Representatives from Truman’s 403(b) investment companies, state 457 plan, credit unions, and more will be available to answer questions regarding saving for retirement, investing for college, and more. For more information, visit http://hr.truman.edu/benefits/octoberevent/. Highlights include group presentations on various topics, opportunities for individual counseling, an informational luncheon and more. The tenth annual General Honors informational reception will take place at 4:45 p.m., Oct. 6, in the Violette Hall Commons. Students interested in pursuing general honors are encouraged to attend. Refreshments will be served. For more information, contact Patricia Burton at 785.7247 or Todd Hammond at 785.7510. The Child Development Center 2005-2006 Seminar Series will feature “Being Proactive About the Prevention of Lead Poisoning in Young Children” from 7-8:30 p.m., Oct. 6, in the SUB Governors Room. This segment will be presented by Dr. Arthur Freeland. Stephen Hadwiger will lead discussion in the Global Issues Colloquium as the issue of “Health: Consumer Good or Community Status?” is examined from 7-9 p.m., Oct. 6, in Violette Hall 1000. Contact the Center for Teaching and Learning at 785.4391 for more information. People can donate $5 to to the Susan G. Komen Breast Cancer Foundation to wear denim in conjunction with Lee National Denim Day Oct. 7. Pins with a swatch of denim and a pink ribbon will be available for a cost of $1 for those unable to wear denim Oct. 7. The pins can be purchased from 11 a.m.-1 p.m., Oct. 4-7, in the SUB. People may also sign an honor sheet with names of loved ones that have survived or lost their lives to breast cancer for $1. The sheet of honor will hang outside Pickler Memorial Library next week. The Student Public Health Association is assisting with this event. Contact Vicky Wehner at vwehner@truman.edu for more information. The Biology Seminar Series will continue with “Water and Energy Use by Desert Birds” from 12:30-1:20 p.m., Oct. 7, in Magruder Hall 2050. Marcus Webster, professor in the biology department at St. John’s University in St. Joseph, Minn., will be delivering the presentation. National Society of Collegiate Scholars inductions will be from 7-9 p.m., Oct. 7, in Pershing Arena. For more information, contact Kara Burns at klb279@truman.edu. An “Acknowledgment and Remembrance Ceremony” for Hurricane Katrina will begin at 7 p.m., Oct. 10, at the Flame to the Second Century. Refreshments will be served in the SUB Down Under immediately following the lighting of the flame. For more information, contact Erin at esm134@truman.edu. The Truman Forensics Union public debate series will continue at 8 p.m., Oct. 10, in the Baldwin Hall Little Theatre. The topic will be “The U.S. Should Urge the Security Council to Expand its Permanent Membership.” The format will be in the National Parliamentary Debate Association (NPDA) style. Students, faculty, staff and members of the Kirksville community are encouraged to attend. In celebration of National Coming Out Day on Oct. 11 and to show support for Truman’s Gay, Lesbian, Bisexual and Transgender Community, Lambda invites people to add their name to the 2005 GLBT Support List that will appear in the Oct. 13 issue of the Index. For more information and instructions on adding a name to the list, please go to http://www2.truman.edu/~martye/GLBTSupportListFall2005.htm. There will be a Quick Grants 60-minute Workshop at 3:30 p.m., Oct. 11, in Pickler Memorial Library 205. This will be a chance to explore funding opportunities from the National Endowment for the Humanities (NEH), the Social Science Research Council (SSRC), and the American Council of Learned Societies (ACLS). For more information, contact Judy Lundberg at 785.7459. The Center for Teaching and Learning is sponsoring a dessert buffet and advising discussions from 7-9 p.m., Oct. 11, in the SUB Spanish Room. Students and faculty are encouraged to come eat and disucss how to improve advising at Truman. For more information, contact Angela Crawford at AngelaC@truman.edu. The American Association of University Professors (AAUP) will meet at 9 a.m., Oct. 13, at the University Club. Contact Marc Becker at 785.6036 for more information. “Confidences Trop Intimes,” the third film in the five French film series, will be shown from 8-10:30 p.m., Oct. 13, in Violette Hall 1000. Admission is free. Contact Rachel Berrey at 785.5359 or rlb938@truman.edu for more information. Who’s Who Among Students in American Universities and Colleges Award applications are available in the Dean of Student Affairs Office, Kirk Building 112. Completed applications need to be returned by Oct. 21. For more information, visit http://saffairs.truman.edu, stop by Kirk Building 112, or call 785.4111. The Career Expo is only a few weeks away. Students can sign up for the Oct. 26 event if they haven’t done so already at the Career Center Web site at http://career.truman.edu and click on the Career Expo link. Students may also have a full-time staff member or trained career assistant critique their resume and cover letter. No appointment is needed for resume and cover letter critiques. The Career Center will host “The Career Doctor is In” from 4-6 p.m. Oct. 11. This program specifically focuses on resume review, advice on how to work a career fair, and how to sign up and apply for jobs at Expo. Additional details will be available in the future. The Residential College Program, Apple Computer, and the Student Union are pleased to announce the winners of the “Frame Your Experience: Student Produced Short Film” contest. First place: “A Day in the Life” submitted by Brian Rose; second place: “Late Work,” submitted by Gabriel Baker and Tyler Phillippi; third place: “Sidewalks,” submitted by Adam Vogt. “Late Work” received the Audience Award. Several other works also premiered including: “Goggles, a Cape, and a Dream” submitted by Marty Meyer, “Brian Goes to College” submitted by Travis Turco, “Long Distance” submitted by Brycen Marner, “Another Dimension-The Doors Truman Opens,” and “College Transition” submitted by Andrew Richmond. The contest sponsors would like to thank the participants and judges. Prize winning films can be seen from the RCP Web site, http://rcp.truman.edu.